There were hoards of us working on 2807 today! Brian, Bruce, Gilbert, John G and John T (oh, and me!) plus half-a-dozen Loco Dept Chap(ess)es, including Alex, Clive, Jeff, Tim and Peter. 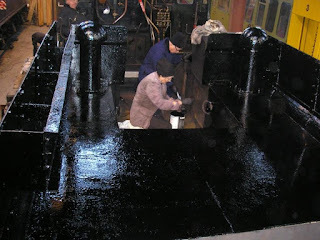 Alex (nearest camera) skilfully having not painted herself and two chaps into a corner, applying bitumen paint to the coal space. Thereafter, the rear section (with dome and filler) had to be painted, too. That was slightly trickier now that there was only one way up onto the back section! 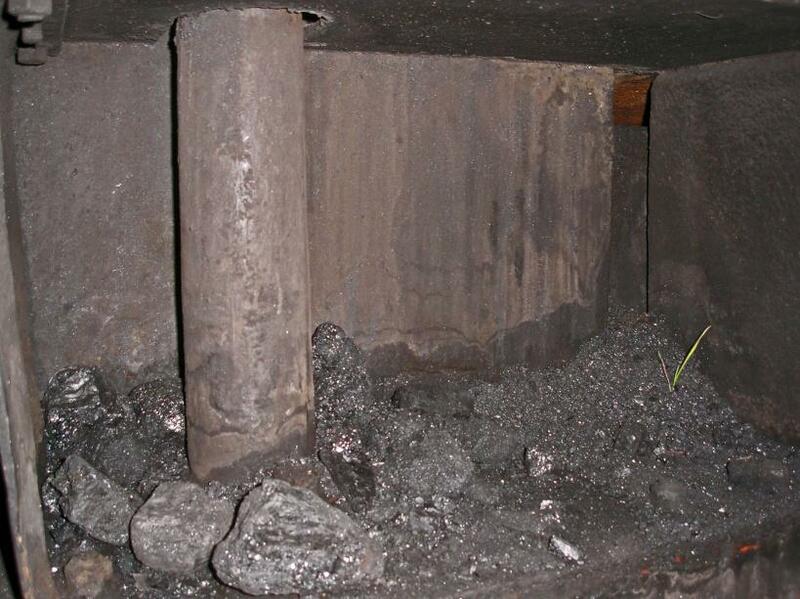 There ensued some toing-and-froing with a set of steps (that were being used to access the coal bunker of 4270 at the same time). Brian dismantled the LHS rocking shaft, while, Gil and Peter looked on, practicing being gophers. 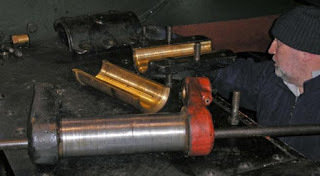 Apart from checking the wear, the intention is to ensure that the brass bearings clamp onto the rocking shaft with zero play. This may mean shaving a few thou’ off the casing (as we did on the RHS). All of this tightening of bearings is in anticipation of getting the valve timing spot on. It had been ‘not bad’, but slackness in various linkages makes it impossible to perfect. John G and John T spent much of the day cleaning the piston valve heads. Getting the grot out of the grooves in the head turned out to be a challenge - one that required the use of a hacksaw blade! 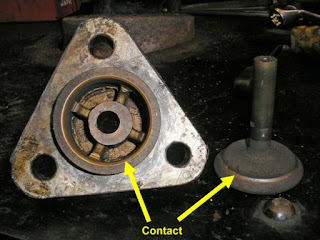 Peter removed the nuts from the RHS cylinder cover in readiness for the piston to be measured for wear. However, the cover was rather reluctant to come off, so he wisely left this as a job that the Saturday gang can tackle. The cover did come off the RHS valve, though. 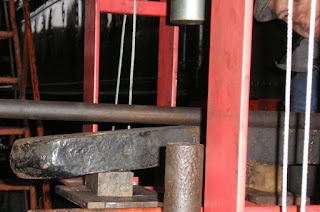 main steam pipes either side of the smokebox. team of painters in the tender! 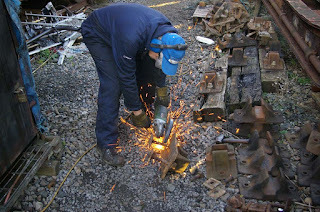 You see, I needed to part the loco and tender. 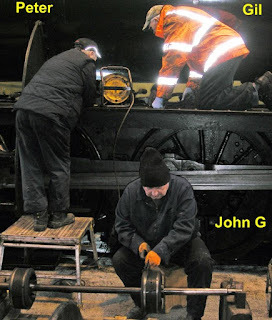 Checking that the loco wheels were chocked and the tender handbrake was on, I removed the securing pins from the links. 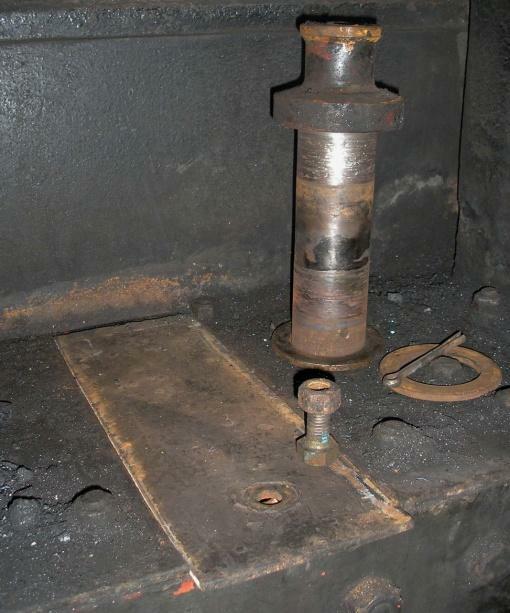 I also put the fall plate back to cover the gap between loco and tender, foreseeing one of the dedicated team inevitably stepping backwards out of the tender and …. Aaagh! While they were all slapping on bitumen, I decided to lift the wooden floor planks in the cab and give them a good clean. 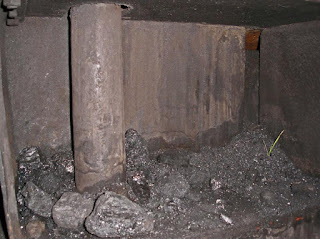 Coal dust and oil get jammed between them and underneath, too. Finally, the tender was gleaming black all over the top and the painters had adjourned. I released the handbrake and pushed the tender back a couple of feet. Two years ago, NYMR managed to bend the RHS safety link (nearest camera) by getting the securing pin down the side of the link instead of through the hole in the end! 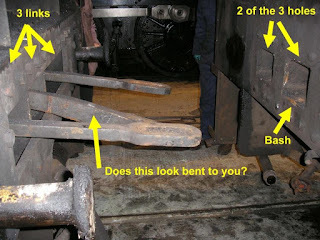 This time, it looks as if the main (centre) draw bar must have been too low when coupling up, and hit the loco’s drag box; probably then bouncing up and into its hole. 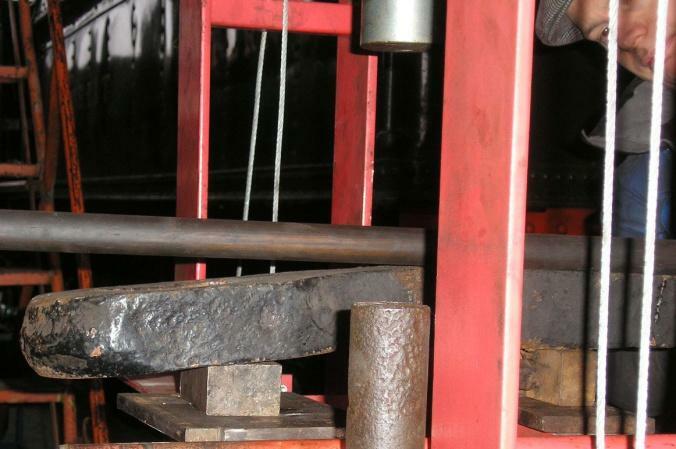 However, the bar definitely appears to have a droop! 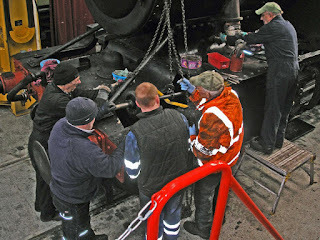 Alistair, Brian, Bruce, David, Gil, John T plus several Loco Dept chaps were working away, mainly on the LHS valve and the rocking shaft. Alistair, John and I tackled the tender and the main draw bar. tapped the bolt holes before fixing that back over the steam pipes. connects to it. However, we could do with some sharp reamers! 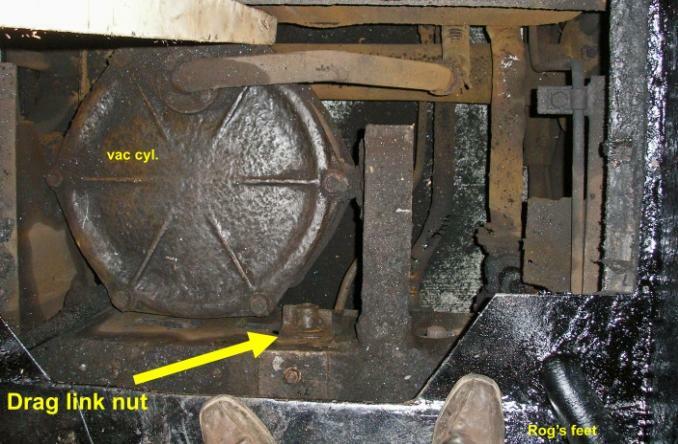 asked loco owners to inspect their nuts and check for any signs of undue wear. screwdriver and copper mallet persuaded this small panel to lift, and we got the pin out. 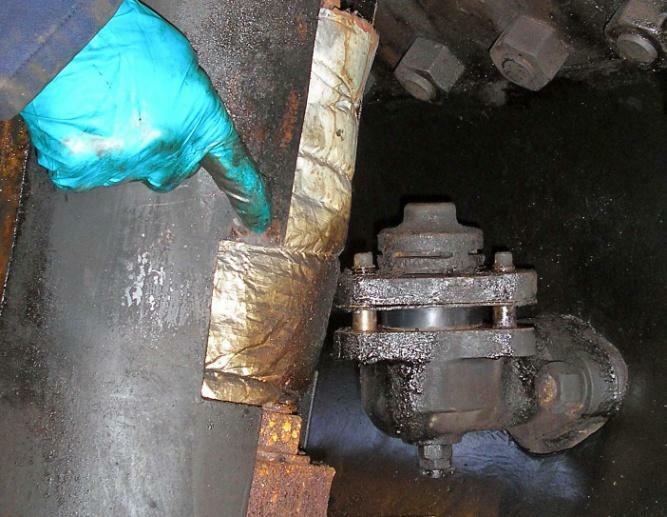 little valve that releases hydraulic pressure had stripped its thread, and was not sealing the fluid. building in my spare bedroom).